Growing up and working in the family bakery business near Roseburg (Oregon), Dorothy Steele aquired the skills of a professional cake decorator by the age of 14. She ws encouraged to take more Home Economics classed in high school, but found her real passion lay in artistic pursuits. She went on to receive a BS degree in Secondary Art Education from Western Oregon University in 1972. Following her passion further, Dorothy shared it with other budding artists while working as an art instructor until 1979. 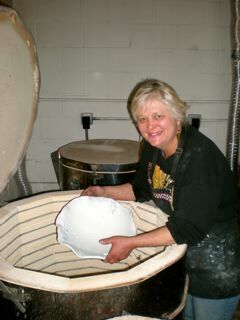 After several years' hiatus, Dorothy moved to Portland, Oregon in 1987, taking advanced ceramics at the Oregon College of Art and Craft. Here she developed a series of handcrafted ceramic containers and bowls that were juried in the Contemporary Crafts Museum and Gallery of Portland. This achievement confirmed Dorothy's dream and steeled her resolve to make ceramic her life's work. 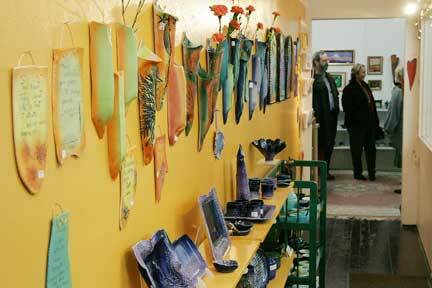 In 1990 , she moved into an industrial space in southeast Portland where she has been devoted to producing fine, nature-inspired pottery for the past 17 years. 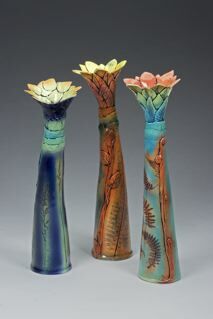 Throughout this period, Dorothy has continued sharing her love of ceramics with students of all ages; and, she has participated in many retail craft fairs, juried shows, wholesale craft markets, and trade/gift shows on both coasts. She has also donated her works to build awareness for breast cancer research (sailing for a Cure), and other worthy causes. She is an active member of the Oregon Potters Association.Now, from her home studio, Dorothy focuses on shapes and textures from ferns, leaves, rocks, hand-crocheted doilies, and other natural and found objects. She presses these textures into slabs of porcelain, creating organic vessels that sprint to life in glazes of brilliant greens, blues, reds, and deep purples - molding these natural forms into functional works of art.